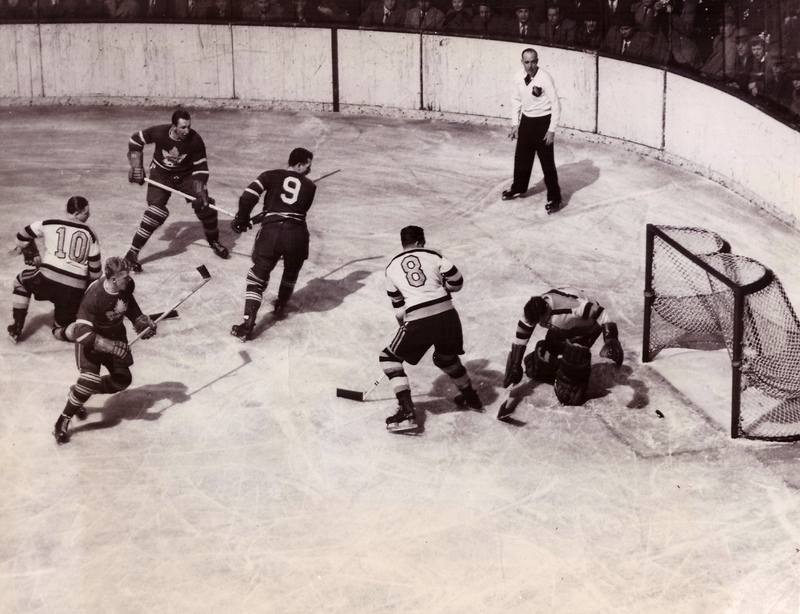 Toronto’s Cal Gardner and Boston’s Grant Warwick each scored shorthanded in the first period of the game depicted here, a Wednesday-night tilt towards the end of March in 1949 in which the Leafs ended up beating the hometown Bruins by a score of 3-2. It was enough to put the Leafs into the playoff finals that year, where the would end up — seems so easy to say — beating the Detroit Red Wings to claim the Stanley Cup. Toronto got a second goal in the first period from 20-year-old left winger Ray Timgren (lower left), and that’s the one we’re seeing going in here. 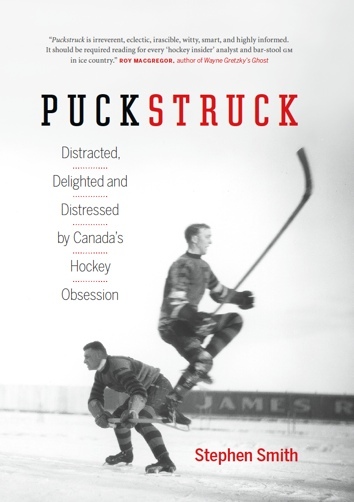 “With his back to Frank Brimsek, Ray managed to move his stick just in time to nudge in a 35-foot drive by [Jim] Thomson,” reported Boston’s Daily Globe on the morrow. Max Bentley put away what would be the Leafs’ winner in the second period. The goal Boston’s Johnny Peirson scored in the last minute of the game? “Really only a gesture,” wrote Tom Fitzgerald. Also on hand here are Boston’s Fernie Flaman (10) and Murray Henderson (8) and Toronto’s Joe Klukay alongside Ted Kennedy (9). The attentive referee is, unmistakably, King Clancy.